As a result of my last gig I was invited to participate in a compilation album that’s being produced by a young fellow I met at the gig. I guess that the plan is to produce an LP (those 12″ vinal things…) with up to 40 tracks, each no longer than 45 seconds. To be honest, I love stuff like this. So far, I have produced two tracks. is from my performance, the middle bit with my Lap Steel, that runs about 12 minutes or so. Using special software, I reduced the running time to 45 seconds. Thus, the entire performance is represented, but it happens at a much faster rate. The pitch would have stayed the same but I decided to drop the whole thing down one octave, just because it felt better to me. is more of a multi-track studio affair. I built the thing up one track at a time, improvising each track as I went. For example, I recorded the first guitar track, then improvised the 2nd and 3rd tracks just listening to the 1st. These three tracks became the 3 note chords. I then recorded the 1st 1/4 note arpeggio, also an improv, and then the 2nd without listening to the first. I improvised the bass part while listening to the chords, then added the 3 vocal tracks, the lap steel, and the bells. When I performed at the Dung Mummy Anniversary event last month, I met a young man by the name of Adam Reese. He performed with the Hop Frog Drum Jester Devotional, smacking a mini trap set. A few days ago he contacted me about a project of his own that he wanted me to participate in. Evidently, he’s producing a compilation LP with tracks by a multitude of artists. Each track, however, must be no more than 45 seconds. This is a unique challenge. He explained that he wasn’t really looking for ‘noise’ stuff. He said he’d enjoyed my performance, and was hoping for something reflective of that. Well, leave it to me to take a perfectly good suggestion and corrupt it terribly. I took the audio from the middle portion of my performance, the bit with the Indy Rail lap steel, and time shifted it from nearly 12 minutes to exactly 45 seconds. I also applied a wee bit of dynamic processing, reverb, EQ, and dropped the audio down one octave.
. [NOTE: This is an uncompressed WAV file that’s about 7.5 MB.] Now, I don’t know if this will be my actual submission, but the result was interesting in a ‘tweaky’ sort of way. 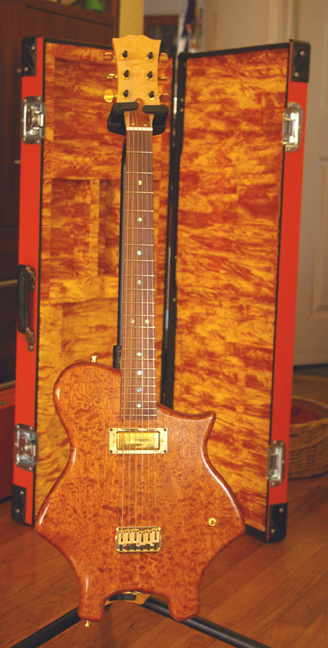 I got a custom case made for my new custom guitar, and decided to have a matching one made for my lap steel. 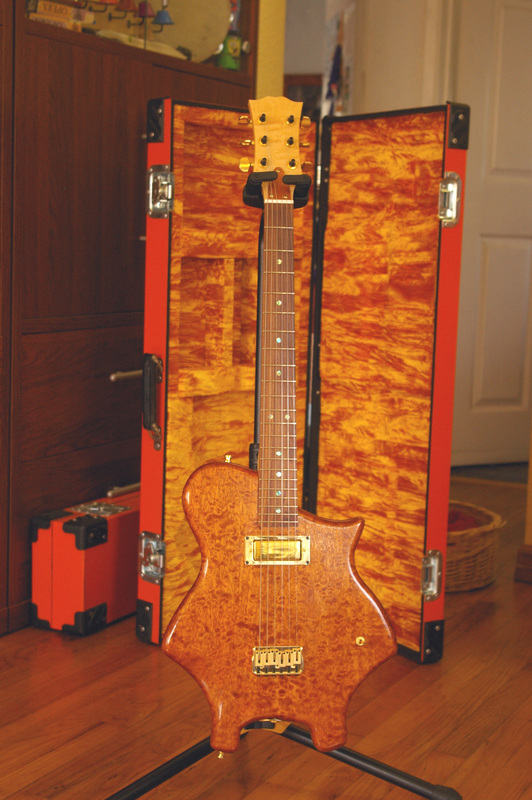 The company that made them, Morris & Holmberg Cases in Santa Ana, did a pretty nice job. They used material I provided them, and painted it with a custom color. Sweet! The Gretsch BST-1500 and/or the Industrial Guitar Indy Rail > Ernie Ball VP Jr Volume Pedal > HBE UFO (fuzz/octave) > Analog Man Sun Face (NKT275 with Sun Dial mod) (fuzz) > HBE Psilocybe (phaser) > Marshall Vibrotrem > DOD DFX94 Digital Delay/Sampler > Line6 Delay Modeler > Fender Blues Jr. Amplifier. I also used a cheap digital voice recorder, purchased in Little India, that I played by holding it against the pickup of the lapsteel. You can hear this about 5 minutes in. Later, I also use an Ebow to create long sustained notes. You can hear this toward the end, around 9 minutes or so. The set of guitar effects I use is designed to provide me with a wide sonic pallet. Each one adds to or changes the sound in a distinctive way. I sometimes use them by themselves, or in combination with other pedals. With the 7 pedals, there are countless variations possible. I was privledged to be invited to perform at the 3rd anniversary of Dung Mummy, a performance event for experimental music, poetry, and other ecclectic creative energy. The event is hosted and organized by the Hop-Frog Kollectiv, a group of adventurous and creative artists from all over the Southland.